Online UPS is typically used to protect CNC machines, computers, data centers, telecommunication equipment, other electrical equipment where an unexpected power disruption could cause production loss, manpower loss, injuries, accident, fatalities, serious business disruption or data loss. A SMPS battery charger is a light weight device which is used for charging a 12V 4ah to 250 ah of different kind of battery by forcing an required controlled current through it. We engaged in manufacturing and supplying a wide range of Air Cooled Servo..
We also offer our clients with quality range of Three Phase Oil Cooled Servo Stabilizers. Automatic control the current and Improves power factor of your industry to reduce power loss and very high saving of electicity and money. Consistently maintain higher power factor and save energy. Low Power Factor leads to poor power efficiency and impose penalty by government. Welcome to JET Electro-Mech Engg. P. Limited. 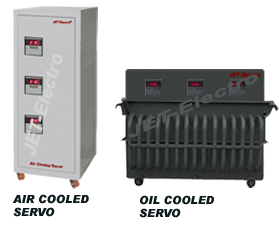 Jet Electro is one of the coveted and best UPS companies in India which deals in supply and development of different power supply systems, electronic products and circuits like Online UPS for computer Systems, UPS for homes and industrial purposes, PF Panels, and Power saving products, servo stabilizers, industrial inverters, 3 Phase online UPS systems, 60hz 3-phase Online UPS and many more. We established our company an era ago and since then we are working hard to supply best and quality products to our customers. All the products we offer comprises of advance technology that deliver consistent performance even under the thrilling conditions. Because of the higher efficiency, maintenance free life, longer service period and economical prices, our products are extremely in demand by our clients. Backed by the highly skilled team of professionals we are able to successfully cater the need of the clients with high quality UPS systems and considered as the best UPS manufacturer among the top 10 UPS manufacturers in India. Our products get manufactured using the best quality and A-one grade inputs along with the modern technology procedure irrespective of the UPS price. Low maintenance cost and High Energy saving capacity are the major factors that make our products suitable to be used in residential as well as in commercial sectors and which force our clients to buy UPS. These systems are really efficient in serving uninterrupted power supply for best and smooth functioning of various industrial applications like online UPS for machine and UPS for medical equipment. Our huge range of UPS systems includes Online UPS, Sine Wave UPS and Offline UPS systems. 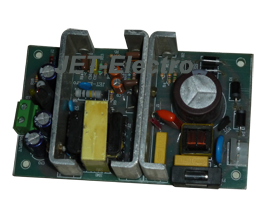 Apart from UPS systems, we also indulge in manufacturing best quality of power saving products. In this category, we offer frequency converters, heavy duty SMPS chargers. The products we offer are specifically made by the specialists using high-tech technology and quality assured techniques and components. Additionally, our wide range of power saving products are lined up with the latest market trends and delivers finest performance for an elongated time period. With the support of classy technology, we are also able to serve the patrons with amazing range of stabilizers. 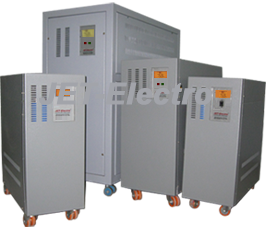 The range we offer under stabilizers inclusive of voltage stabilizers, Servo stabilizer, Power stabilizers, three phase Voltage stabilizers, AC stabilizers and automatic voltage stabilizers and PF Panels. We produce all these products in special devotion with international and quality standards that deliver best performance in every circumstance.